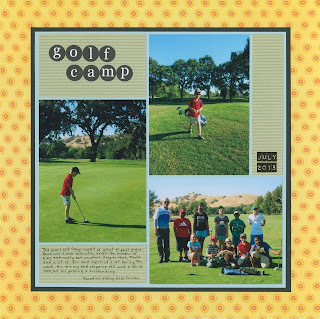 Trevor has been participating in a summer golf camp at a local course for the past three years. The first two years were amazing, so we had high hopes that this year would be equally awesome. Unfortunately, it was not. There was a new instructor, which was the primary reason camp was so much worse than the previous two years. On top of that, they enrolled twice as many students AND camp took place during a heat wave. Fortunately, Trevor still loved it. To represent the hot weather, I used a yellow and orange background paper. It's quite a bit different from the golf layouts I've done in the past. Bummer that this year was a letdown ... but glad he still had fun! LOVING the page ... LOVING the yellow background!!!!!!!!!!!! Based on your posts over the years, I get the impression that Trevor is one of those people that just "goes with the flow" and finds the good/fun in every situation. Your BG paper DOES remind me of a hot day and it looks great w/ the green! Love the colours here! I miss golf...that was my obsession before scrapbooking!